Kneale Mann | Leadership: Can I Help You? Do You have it in blue? Then you really need help, you like the shirt but can't find your size. You don’t want to call the Chipster back, you just want the shirt not the sales pitch. Ultimately you walk out with the decision to do without the shirt avoiding more time spent with the over attentive sales dude. It’s one of those days where you wonder why you’re on the verge of passing out. You then realize that it’s 3pm and all you’ve eaten that day is a chocolate chip cookie at your 10am meeting. You sit at your desk in a haze wondering if anything you said made any sense to anyone. Blood sugar levels need attention. So you grab your keys and head to the closest drive-thru’. Guilt is overwritten by need and anything to keep the wolf from the door will do. Then you are met with the barely breathing attendant at the other end of the speaker who can hardly muster the energy to lob your burger combo into the bag. Your happiness is not a concern. The cheese is missing, they added extra pickle when you asked three times for none and you don’t even like root beer. But you gag down your late afternoon feast and try to forget the ordeal as quickly as possible. Your day ends without that new shirt and a delightful case of heartburn. Which outlet is giving great customer service? 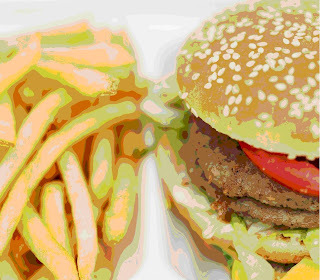 Chippy doesn’t care about solving your pain, he just wants to make his numbers and our friend at the burger palace is simply putting in time – the similarities between what you ordered and what you get are strictly coincidental. Are these two places common or rare? How could each improve during our tight economic times? Are you working in either environment?